I admit that the best part of summer meals are typically the desserts. Who doesn’t love a cool, sweet, satisfying dessert in the swell of the summer heat? Certainly I do, and yet it is easy to fall into the usual routines of summer desserts. However, I am here with a different way to slice up your summer dessert. I will confess that I have been trying to make this dessert and get it on the blog for weeks. By the way, this isn’t a complicated time consuming or expert level dish. This is a dessert that takes 10 minutes and will please any palate in my estimation. Oh, did I mention you make this one the grill? I know, I’m talking about grilling. Shocking, isn’t it? What is the mystery dessert? 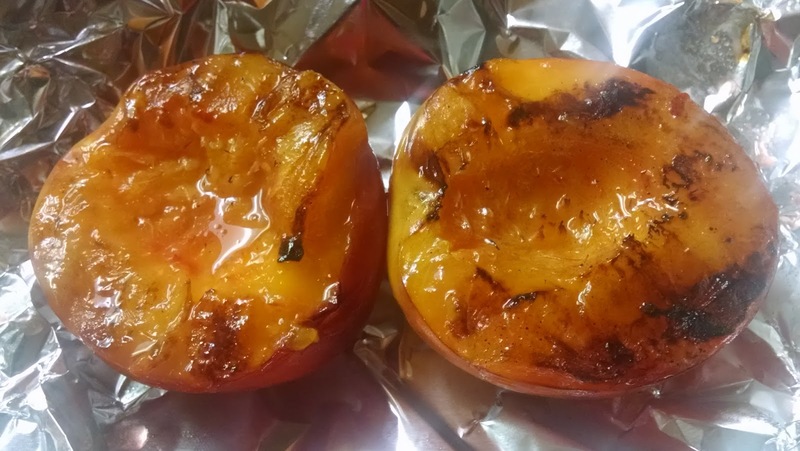 Grilled stone fruit. In other words, peaches, pears, apricots, and of course, nectarines all finished on the grill. How does it work? It is very simple actually. As we know, all of these fruits contain a lot of natural sugar and we are just coaxing that sugar to the surface with a little heat. The goal is to caramelize the outside of the fruit and and let it soften up a little bit. Congratulations! You have done it! I don’t really have to say much more……but I am going to because I can’t just leave it at that. There is only one rule when it comes to selecting your fruit. You want the fruit to be pretty firm, with a little bit of give. We want our fruit to be able to stand up after it comes off the grill. We have all had that one piece of stone fruit that is overripe, hard to handle, and can be messy. That isn’t what we want here. Okay, got that? Good. First, preheat your grill to medium heat and make sure to clean your grates so you don’t get pork flavored stone fruit. If you you want that profile, then go crazy. I will make sure we find an application for that later in our blogging adventure. It might be good to wipe the grates down with a freshly oiled towel to help remove any remaining meat oils or bits from the grates. Next, split the fruit into halves, remove the pit, and then just splash a little bit of neutral oil on the cut side of the flesh. Place cut side down on your grill and check every few minutes until the flesh picks up some grill marks and the natural sugars caramelize. This should take about 6-8 minutes on the grill until you have something that looks like this. This picture says it all and you would be correct. I could probably stop here, but if you know me, I like to go the extra mile for all of my readers. Ready? Here we go! You can serve this fruit a number of different ways and there are really no limits. Here is one of my favorite applications. 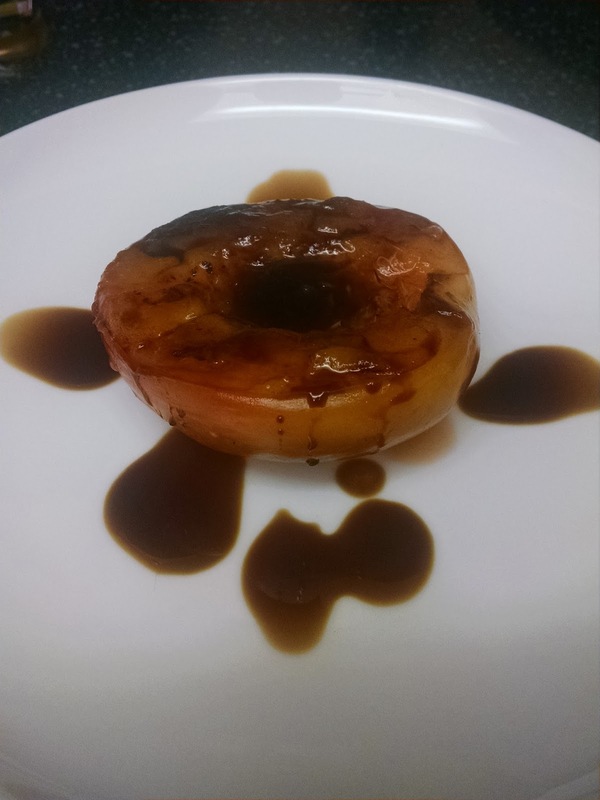 Here is a grilled nectarine with some reduced balsamic vinegar. Okay, before I go on, let me just say that I’m not talking about the stuff you buy from the shelf of your local big box store. I’m talking about balsamic vinegar that has the consistency of syrup, some real sweetness, and a little bit of that vinegar finish. Trust me, you would ever mistake the one for the other. You might be able to find a specialty store that sells olive oils and they will likely carry good quality reduced balsamic vinegar. If you can’t find it anywhere, no problem, because you can make your own. Here is a recipe for an simple, easy balsamic reduction that would work very well if you want to try your hand at making your own. If balsamic isn’t your flavor, how about some yogurt sweetened with a little honey instead? You could also make some whipped cream and spoon some on top. If you want to make adult style whipped cream, add a few splashes of your favorite bourbon or whiskey to really make your fruit happy. Still not enough? Okay, how about a scoop of good vanilla ice cream to go on top of this beautiful fruit? As you can see, the options are endless! What could you do with left over grilled fruits? You could chop them up and throw them into some pancake batter or top your pancakes with them. You could also add the fruit to your favorite smoothie for a little extra complexity and sweetness. Hey, why not add to your barbecue sauce collection? I know I would! If you want to really add a nice counterpoint, sprinkle the a little salt on top of the fruit and serve. I promise, you can’t go wrong!